South Korea's national flag shows a blue and read coloured circle on a white background. The corners of the flag are filled with black patterns of different lines. The white background represents - depending on the view - Confucian purity or Buddhistic emptiness. The centered circle is named T'aeguek which is a symbol for balance or harmony between opposites in Taoism. There is a upper red half and a blue half below. The red one stands for Yang (heaven, day, man, warm, activity, creation, a.s.o. ), the blue one represents Yin (earth, night, women, cold, passivity, destruction, a.s.o.). These two cosmic forces are always in balance despite they are opposites. Following the rules of wisdom they are not fighting against each other but are two different sides of one and the same coin. Each three lines in the corners of the flag are called trigrams and go back to the most important ancient book of Chinese way of thinking called I Ching. The Koreans call it Chu Yeok. The three plain lines in the upper left corner stand for heaven/creation, the three broken lines in the lower right corner represent earth/receptivity. The trigram on the upper right means water/treacherous danger, the bottom left one stands for fire/loyal love. South Korea's national dish is called kim'chi. Simply said it is just pickled Chinese cabbage, which is seasoned with hot sauce. 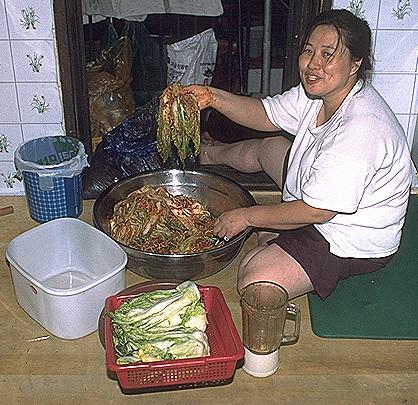 The preparation of kim'chi needs a lot of instinctive feel and it is said that a woman is supposed to be able to prepare good kim'chi in order to find a good husband. Anyone developes his own recipe, but at least you can say: The longer the cabbage is pickled the hotter it becomes. The basic recipe might be like the following: Five cups of coarsely chopped Chinese cabbage are mixed with six teaspoonfuls of sea salt. Let it draw for three hours and then rinse it off and dry it properly. Now the spices come in. The cabbage is mixed in a dish with two tablespoons of sugar, crushed red chili according to the intended hotness, a quarter teaspoonful of crushed ginger, one finely crushed garlic clove and two finely crushed green onions. These ingredients are preferably properly mixed using your hands. Eventually time is important. The cabbage is stored - at best in special ceramic pot or in a dish which is covered with cling film - for two days at room temperature. Kim'chi should be served chilled. The national flower of South Korea is called Mugunghwa. 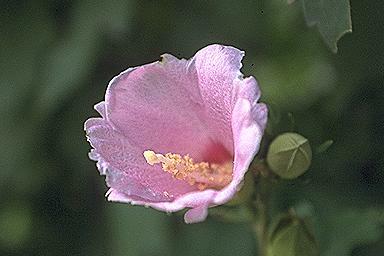 It is a kind of shrub which shows pink or blue/violet blooms. The name means eternal flower.